So there’s a story to be told on this one but we’re going to keep it as brief as possible. The lucky person who decides to make this theirs will hear it all directly from Bob who initially purchased this bike to keep for himself. The seller might in fact be disappointed to see that Bob changed his mind. It is the kind of machine that’s right up his alley. 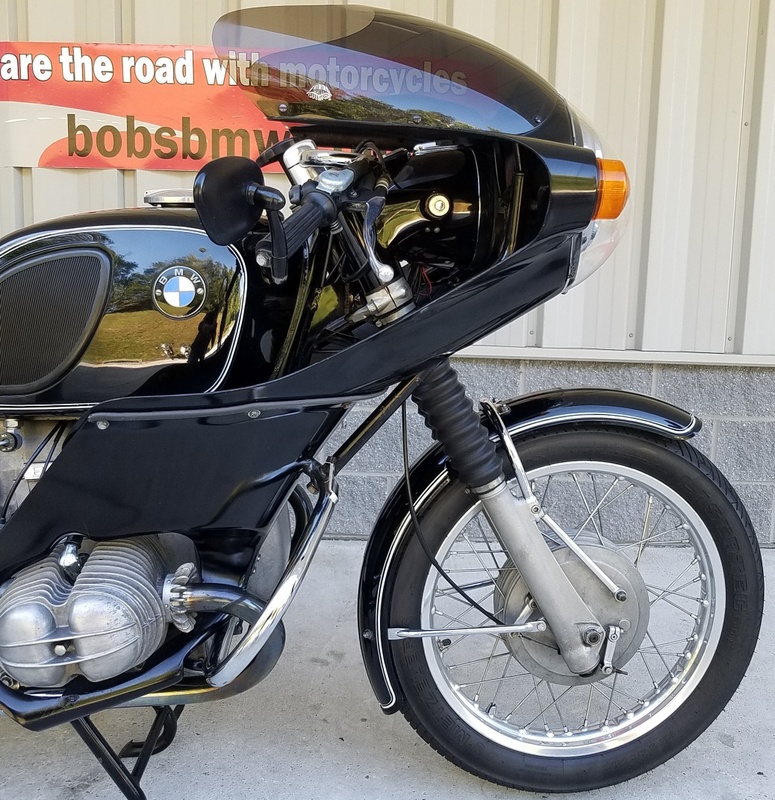 In the early days of Bob’s Used Parts, the original business he started and the corporate name behind Bob’s BMW, Bob actually had about 7 or 8 complete sets of these rare, cool, sporty Avon Lynx fairings from an accessory distributor buy-out he completed. 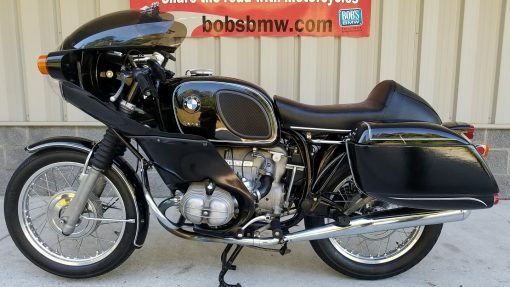 He’s been kicking himself almost ever since that he did not hold onto one complete set as it would have been perfect to display in the Vintage BMW Museum which was where he had intended to place this entire machine after riding it for a while. 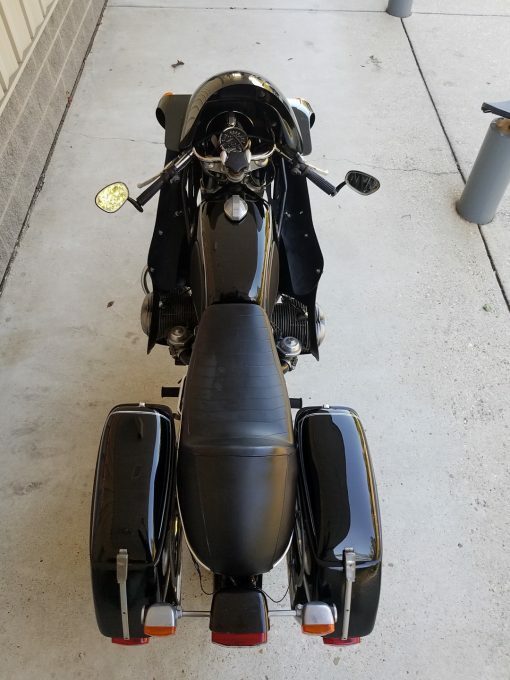 The rest of this tale will have to wait until the bike has a new owner. This is very a special machine in our experienced opinion and of an overall package we’ll not likely see again. 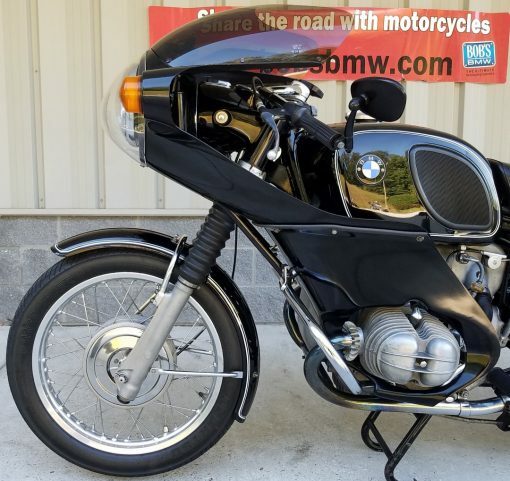 It clearly saw a lot of attention during the build or conversion from a stock 1970 R60/5 to the hybrid it is today. 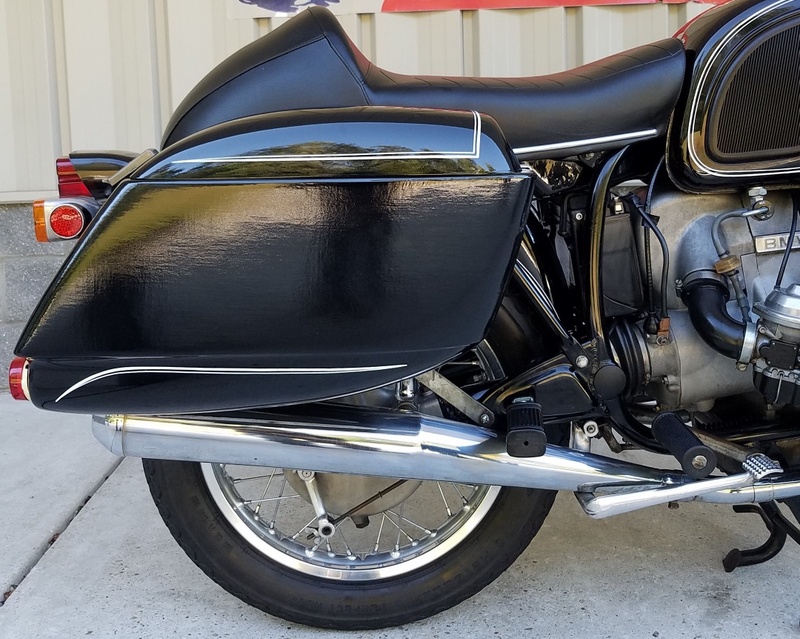 With power coming from a later, and lower mile R90/6 motor dating 1976 by the VIN stamping in the engine case, which also includes a higher output electrical system (180 watts to 240 watts). 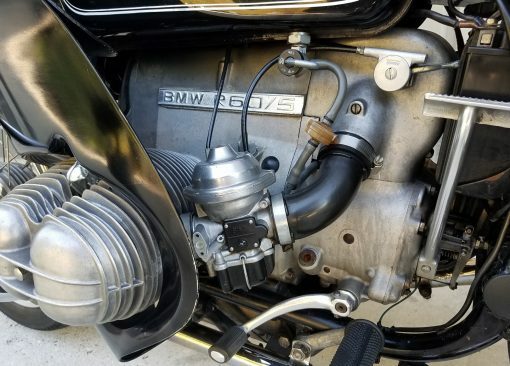 The original superbly and solidly built /5 series four speed gearbox with the only truly functional kick starter BMW built after 1969 is what connects the motor to the driveshaft and the 37/11 final drive (3:36 ratio) original to the R60 which makes this machine far sportier in nature than a stock R90 which would have had a 34/11 or 3:09 gear ratio. 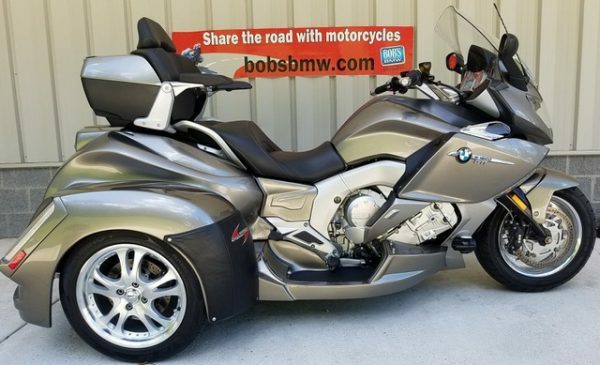 On this bike you can spend most of a day on sweeping, roller-coaster back roads having a great deal of fun and remain in 2nd and 3rd gear the entire time. Bob has done bikes like this several times in the past for himself and friends, especially in the late days of Bob’s Used Parts and early days of Bob’s BMW combining even R100S motors with 4 speed boxes and lower final drive from 600 or 750’s to get a sportier ride. He still prefers the 4 speed to the 5 speed on sidecar conversions we build occasionally. And this custom also sports a much later set of Bing CV carbs with the updated floats and bowls offered by Bing themselves. It is also possible there are some internal mechanical or electrical upgrades the original constructor added that the prior owner, as well as our team have not uncovered as there was no need to open it up. Cosmetically it has the gorgeous, rare Avon Lynx sport fairing that is mounted on a mostly original /5 rolling chassis with MOSTLY original bodywork and paint including the upgrade larger 5.8 gallon fuel tank with knee pads as delivered by the factory when new. The front and rear fender are still as beautiful as the tank and while all show the ever so slightest age they are truly in great shape considering this stuff is now 48 years young. The seat is a period correct custom solo seat that matches the Lynx lines and saddlebags with visual perfection. While some may prefer the stock /5 standard bullet end silencers others lean towards the later /6 and /7 hollow point bullet style ends and this is what is attached to this offering. 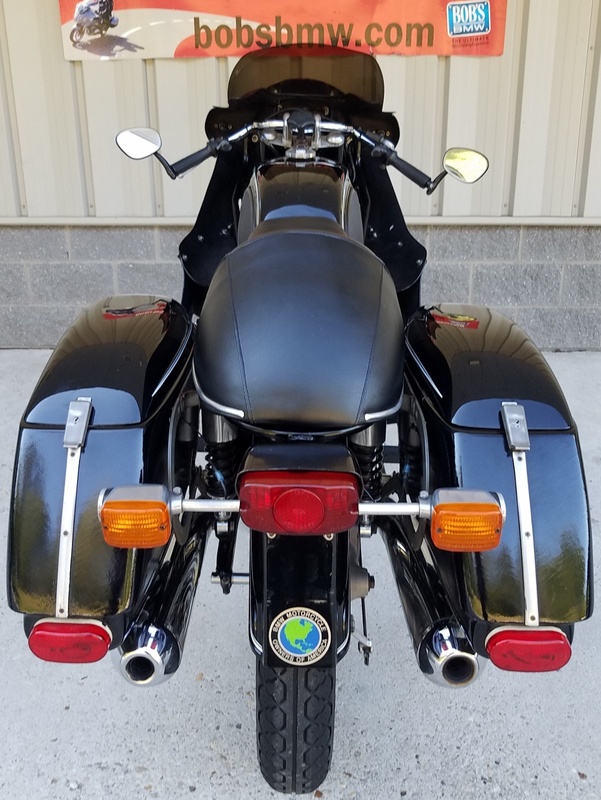 Completing the visuals on this bike is a set of Wixom Brothers saddlebags also finished in Avus black with white pinstripes to match pretty perfectly. 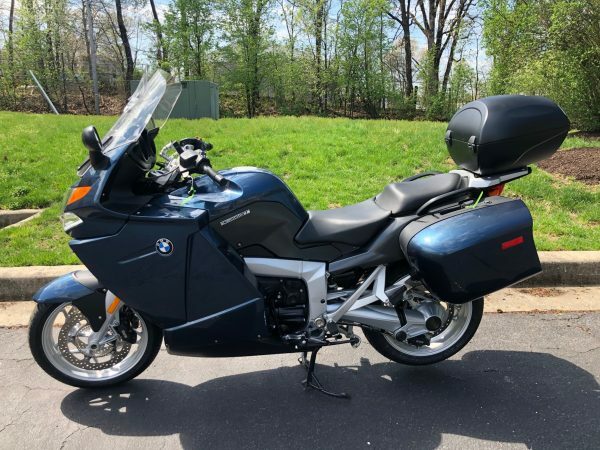 These highly functional touring bags (top loaders) are easily removed when not needed and like the seat and fairing are a very period correct accessory and difficult to find in such good condition as these are. 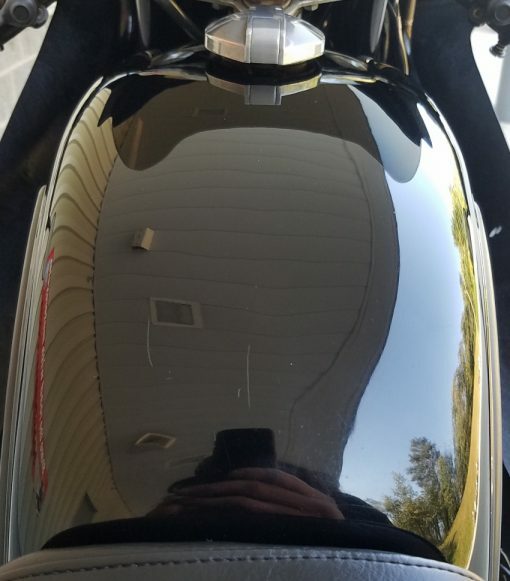 Overall the factory paint or gel coat on the fairing is in exceptionally great condition and it’s hard to find even tiny scratches but it does have some patina if one looks closely. The frame and sub-frame, headlight and mounting ears as they are called area also in great original condition. Most castings show very little age, discoloration or oxidizing as it’s most often referred to as compared to all other examples we’ve had the opportunity to see and inspect in and outside the dealership. The rims are in excellent condition, very bright and polished correctly with almost no noticeable marks from the tire changes it has been through and the spokes are in very good original condition but do have light chrome deterioration as would be expected on almost every bike of this era and many that are far younger. The chrome hubcaps are correct, original and also in excellent shape. All the small items like hardware, switches, trim on the speedo/tach combination instrument, turn signals, badges on the engine, carbs, wiring and on and on are in truly remarkable condition. 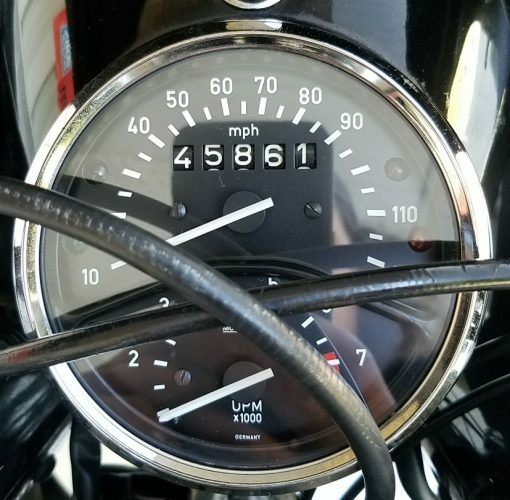 It’s clear that assorted rubber parts, cables, fuel line and other wear items that would be replaced many times in this many years have been regularly addressed over its life thus far. With the right bag off one still has full access to the BMW storage tray (sits directly over the battery) which is where you’d store the complete factory tool kit in the original tool pouch which is included. 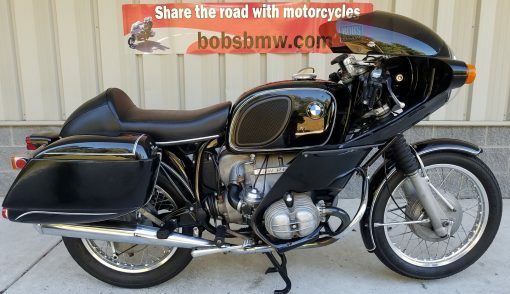 So is a nice reproduction shop rag with a BMW logo and the original owner’s manual which while not perfect is correct for the bike. 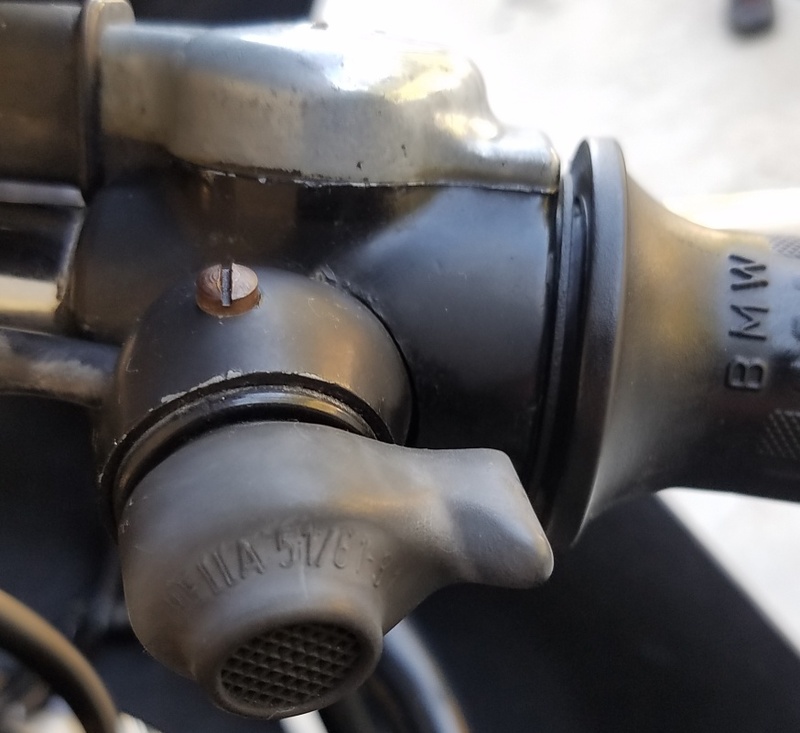 Included as well is the correct factory tire pump mounted under the seat, plus a flat spare, the black knob key and one for the fork and seat locks. Also included is a new looking clear sport screen in what appears to be the original wrapping from Gustafson Plastics (same source as the tinted one mounted now) in case you, as the next owner wishes to swap out with the dark tinted one that’s installed for any reason. But there’s more – the headlight upfront is covered with a very correct and even rarer than the fairing clear nose covering and this offering comes with the other, more common headlight surround that’s all black and all these items are shown in the final image with the other assorted spares. These machines must use a low or Clubman style handlebar and these were the exact bars that Bob acquired with those complete sets many years ago. 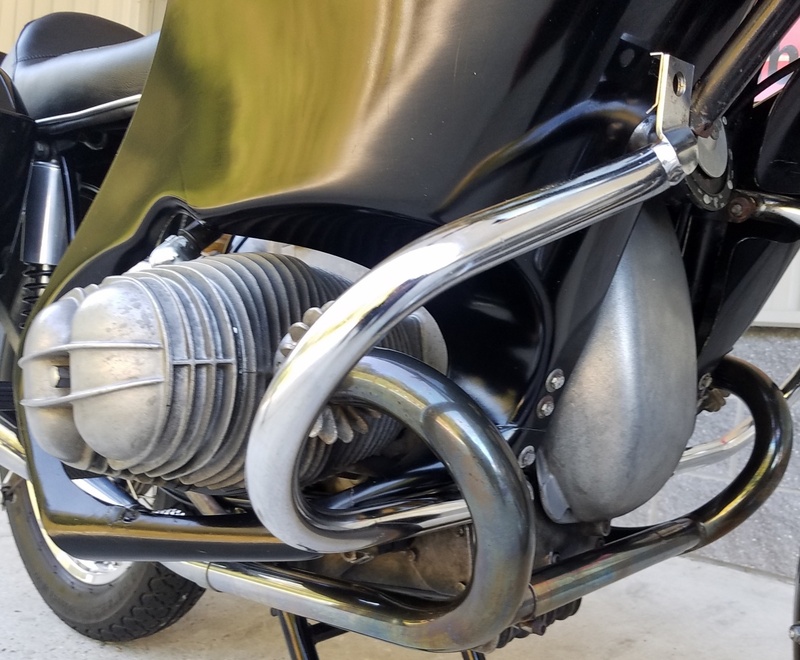 If one selects to take the fairing off for a naked ride style, the cylinder guards can remain in place – part of the genius of the original Avon design execution. And of special note are the original Touring style Albert mirrors at the ends of the bars. While Bob’s offers a very finely crafted reproduction of the sport version in black or chrome, the taller length touring versions were never copied so if you desire the lower version we’d bet that you could entice Bob to swap them with you. 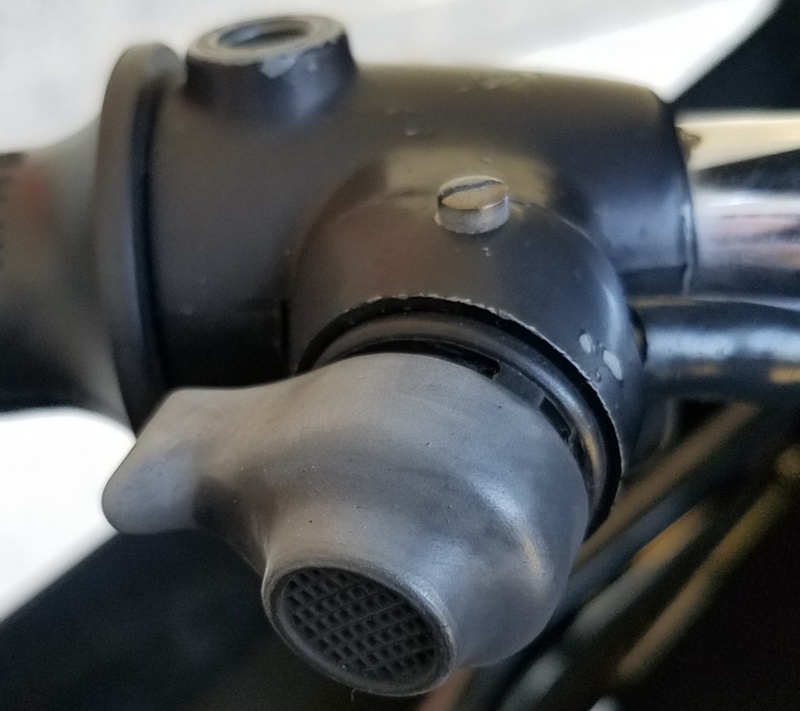 And on the right or throttle side one will find the original, correct and simply functional Magura throttle lock screw underneath the controls by your thumb. The frame near the fairing mounting points and crash guards that are an integral part of this fine installation system, the battery tray halves and the swingarm all have some light patina – it’s basically impossible to place almost 50,000 miles on a bike and not have some story to tell about where it’s been and the road surfaces and weather it has experienced. 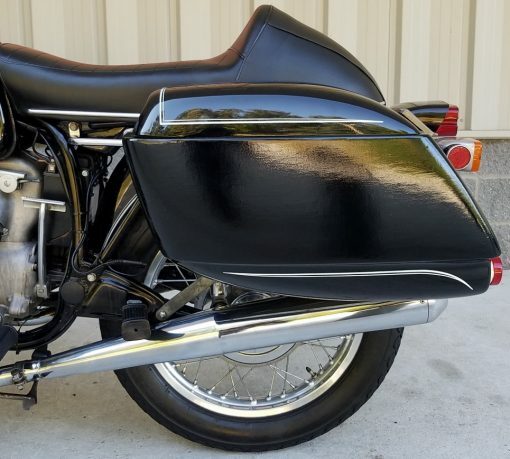 But you’ll be hard pressed to find a more original and beautiful example with such fine factory paint on the tank, fenders, headlight and more nor a bike that is likely to turn so many heads the moment you and this machine appear at any bike event, motorcycle shop or even the local Starbucks. Most of the staff here at Bob’s think that Bob should rethink his decision. Like any other offering we’ve scrutinized this one closely in addition to taking it out for a good test ride, in this particular case just shy of ten miles. It’s been run through the Maryland Safety Inspection (MSI) process and everything is properly up to or well above those standards. Fluids are all clean, the bike jumps to life easily, runs, idles and accelerates as designed, the brakes and suspension all operate smoothly and we anticipate no issues in the near or distant future but we also want to remind the next buyer or just interested parties that this is a vintage machine and no one, including us, despite how much effort we might expend to ensure it’s safe and roadworthy can place a warranty or guarantee for time or miles on such an offering. We even replaced the gas cap seal with a genuine new BMW replacement part which is not a simple task. 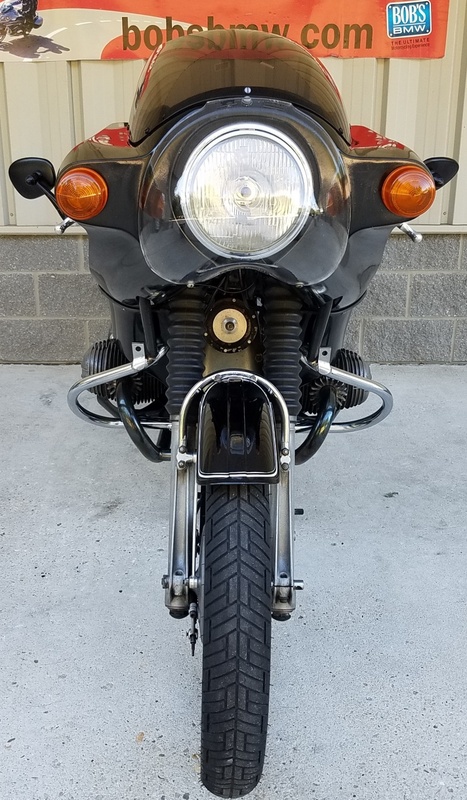 Finally, we do wish to share that while we find this machine to be highly desirable, truly beautiful and a superb ride, both in its originality and in its superb period customization and general care that it shows it has seen it does have a few small scratches and paint blemishes that one can find upon a close inspection. 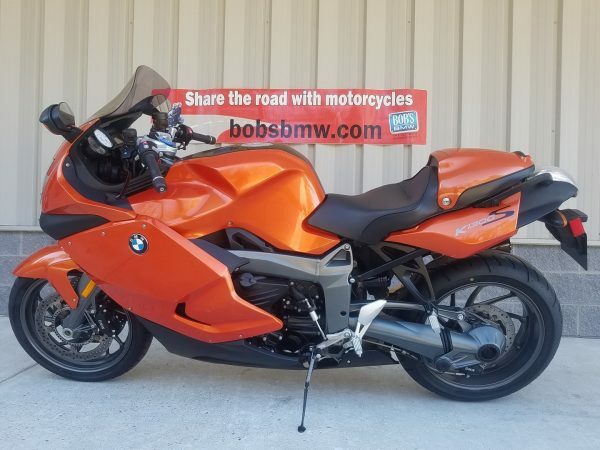 It’s not a new BMW with 100 + HP and a menu of amazing electronics to help one go fast, slow down or do everything in between. It is a vintage café style sport bike ready to be enjoyed within the parameters of a little less horse power (about 60) suspension (springs & struts) and brakes (double leading drums) that was top of the line in its day and some fine period mods making it a true show stopper. Ride this one as it was intended to and you’ll never return home with anything less than a big grin. • Serviced, MD Inspected, RIDE!